Here's a quick guide for the new Ninja Road Battle Mode in the action RPG turn based mobile game - NARUTO: Ultimate Ninja Blazing. All-New Mode! Embark on the Ninja Road! What is Ninja Road (Game Mode)? 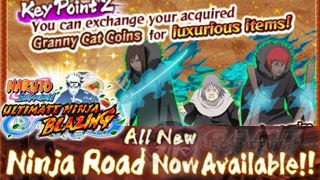 - Ninja Road is an exclusive new mission and challenging single-player event with no continues! - Each run costs 20 Stamina, there are 20 stages or maps to complete. - Create up to three teams with a maximum of six characters each (18 characters max! ), and put them to the test. - This time there are no Helpers to lend a hand, and you can't place the same character in multiple teams. - The good news? There are No Team Cost Limits to worry about, and you can choose which team you want to send to which Map (between stages you can select a different team). - If one of your teams reaches 0 health, you won't be able to use them again for the rest of your run. If all three teams reaches 0 health, you lose. - For every 5 stages, you'll encounter a Boss. - If you manage to take them down, you'll be rewarded with a powerful Boost effects which will last a set amount of turns. - There are plenty of different Boosts to help you take the upper hand in battle, but their effect only lasts for so long after you clear the previous Map! The trick is to gain as much ground as you can before the effect runs out, so you can reap the maximum benefits from the Boost! - Even if you don't make it to the end, you can still get rewards for completing a certain number of maps! The more you progress, the more rewards you get. - Note that your rewards will be based on the last Boss you defeated. - There are some rare and special stages too that will randomly appear as you go, these stages will also give extra rewards, and are sometimes easier to complete. - Always take note of the elements of enemies and bosses, then arrange your team to counter them. - As always, stalling can really help a lot for charging Chakras and building up Ultimates. Switch to fill up your teams' Chakra Gauges early on and if needed. - Note: Your team's buff turns/durations will get paused if not in use. However, buffs that you get from Bosses will expire after a number of turns, so use them well. - This team will take care of maps that has multiple normal/strong enemies. - Preferably ninjas that are decently strong and can spam their Ninjutsus. Secret Techniques ain't bad either if used right. - This team will take care of stronger enemies, especially at later stages, useful for dealing quick bursts to enemies before they can take a huge advantage over you. - Nukers can either be AoE or Single Target. - If you have units that can Push enemies, it is also a nice idea to pair them with Tanks or Dodgers. The aim for this combo is to lure enemies near dangerous Field Effects like Poison Fogs, then push them towards it to deal damages overtime. - This team will take care of Boss battles, customize them as needed especially to counter the Element of the Boss. Note that if you can handle early bosses pretty well, then try to conserve their Chakras or Ultimates. - Same, nukers that are AoE or Single Target, as long that they can dish out massive damages. - Also bring Attack Boosters if you want. - Preferably, with Slip damage and/or ATK reduction, since these effects are good options vs high HP and Attack Bosses. 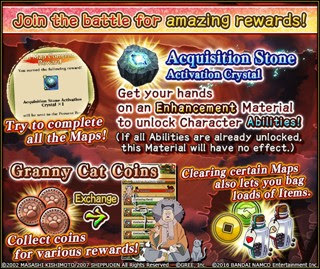 - You can farm Granny Cat Coins by doing multiple runs in Ninja Road, use them to purchase exclusive ninjas and various items from Granny cat's Hiding Place (Shop).